* To what extent is the Bible inerrant? * Can you prove it? 1. Jesus was a human being. 1. The Bible is a human book. The mistake is to assume that Jesus is simply human. Mere human beings sin. But, Jesus was not a mere human being. He was also God. Likewise, the Bible is not merely a human book; it is also the Word of God. Like Jesus, it has divine elements that negate the statement that anything human errs. They are divine and cannot err. There can no more be an error in God’s written Word than there was a sin in God’s living Word. Can the Bible use approximations and still be without error? Can a New Testament writer quote freely from the Old Testament and claim that the resultant quotation is without error? Can a biblical writer use the language of appearances without communicating error? Can there exist different accounts of the same event without involving error? If the Scripture includes approximations, free quotations, language of appearances, different accounts of the same occurrence, can that type of data support a definition of inerrancy as “being without error”? 1. Negative description: The Scriptures are without error. 2. Positive description: The Scriptures tell the truth. B. Evangelical Dictionary of Theology - “Inerrancy is the view that when all the facts become know, they will demonstrate that the Bible in its original autographs and correctly interpreted is entirely true and never false in all it affirms, whether that relates to doctrine or ethics or to the social, physical, or life sciences (Feinberg, 142; Feinberg, “The Meaning of Inerrancy,” Inerrancy, 249). 1. Article IX: Inerrancy – We affirm that inspiration, though not conferring omniscience, guaranteed true and trustworthy utterance on all matters of which the biblical authors were moved to speak and write. We deny that the finitude or fallenness of these writers, by necessity or otherwise, introduced distortion or falsehood into God’s Word. 2. Article XII: Inerrancy of the Whole – We affirm that Scripture in its entirety is inerrant, being free from all falsehood, fraud or deceit. We deny that biblical infallibility and inerrancy are limited to spiritual, religious or redemptive themes, exclusive of assertions in the fields of history and science. We further deny that scientific hypotheses about earth history may properly be used to overturn the teaching of Scripture on creation and the flood. 3. Article XI: Infallibility – We affirm that Scripture, having been given by divine inspiration, is infallible, so that, far from misleading us, it is true and reliable in all the matters it addresses. We deny that it is possible for the Bible to be at the same time infallible and errant in its assertions. Infallibility and inerrancy may be distinguished, but not separated. Jesus said to the religious leaders of his day, “You nullify the word of God by your tradition” (Mark 7:13). Jesus turned their attention to the written Word of God by affirming over and over again, “It is written” (e.g., Matthew 4:4, 7, 10). This phrase occurs more than 90 times in The New Testament, a strong indicator of divine authority. Author of Hebrews declared that “the word of God is living and active. Sharper than any double edged sword, it penetrates even to dividing soul and spirit, joints and marrow; it judges the thoughts and attitudes of the heart” (Hebrews 4:12). Logically, the argument is valid. So, if the premises are true, the conclusion is also true. Jesus, who is God referred to the Old Testament as the “Word of God” which “cannot be broken” (John 10:35). Jesus said, “until heaven and earth disappear, not the smallest letter, not the least stroke of a pen, will by any means disappear from the Law until everything is accomplished” (Matthew 5:18). Paul says, “All Scripture is God-breathed” (2nd Timothy 3:16). Scripture is from “out of the mouth of God” (Matthew 4:4). Therefore, the Bible Cannot Error. If God cannot err and if the Bible is the Word of God, then the Bible cannot err. “The God of truth has given us the Word of truth, and it does not contain any untruth.” Dr. Norman Geisler, 74. 1. Deuteronomy 13:1 - 5; 18:20 - 22: Israel is given criteria for distinguishing God’s message and messenger from false prophecies and prophets. 2. One mark of a divine message is total and absolute truthfulness. 3. A valid parallel can be made between the prophet and the Bible. The prophet’s word was usually oral, although it might be recorded and included in a book; the writers of Scripture communicated God’s Word in written form. Both were instruments of divine communication, and in both cases the human element was an essential ingredient. 1. Jesus rests an entire argument on a single word (e.g., John 10:34 - 35)...Jesus endorses written propositional statements, not merely concepts, thoughts, or oral tradition. a. Jesus assumes the historicity of God’s appearance to Moses. b. Jesus assumes that God’s revelation came in a propositional statement. c. He assumes that every word could be trusted to be precisely accurate. d. He assumes that doctrinal truth has to be based on historical accuracy. e. He assumes that one could use even unlikely passages and trust their accuracy. a. Single letters change words. b. A tittle is even more minute than a jot. c. Jesus promised that not one jot would fail. Every promise will be fulfilled just as it was spelled out. d. Promises involve more than just faith. If the Bible’s inerrancy does not extend to every detail, these arguments lose their force. Moreover, should I have a lower view of Scripture than Jesus Christ? 1. It has been the view of the church in every period of its history. John Wesley: ”Nay, if there be any mistakes in the Bible there may well be a thousand. If there is one falsehood in that Book it did not come from the God of truth” (Journal VI. 117). 1. Epistemology is the discipline that is concerned with how we know that we know something to be true. a. For some, knowledge claims must, to be justified, be indubitable or incorrigible (beyond doubt and question). It is not enough that a belief is true and is believed on good grounds. It must be beyond doubt and question. For such an epistemology, inerrancy is essential. Inerrancy guarantees the incorrigibility of every statement of Scripture. Therefore, the contents of Scripture can be objects of knowledge. b. For some, knowledge claims do not require such a high standard of certitude as indubitability to have inerrancy: If the Bible is not inerrant, then any claim it makes is false. This means not that all claims are false, but that some might be. But so much of the Bible is beyond direct verification. Therefore only its inerrancy assures the knower that his or her claim is justified. 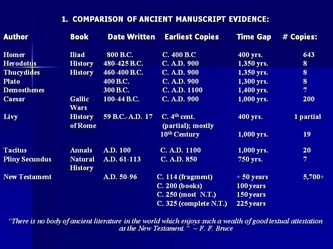 We have more manuscripts than any other work or collection of ancient antiquity. We now have approx. 6,000 manuscripts. 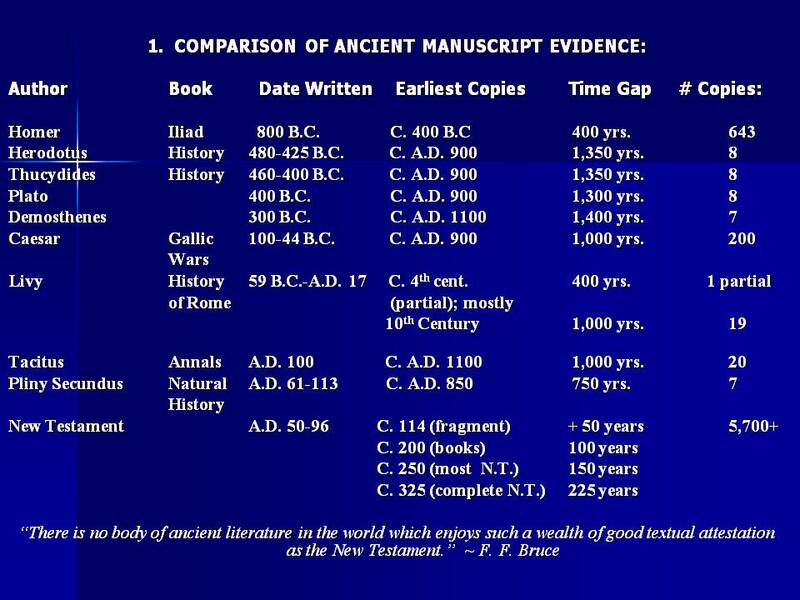 For example: we have 7 copies of Plato’s work compared to 6,000 N.T. manuscripts. Moreover, we have more copies closer to the original than any other work of antiquity. Finally, we have 99% accurately copied as opposed to any other work. Whose history can we better trust? a. Do the witnesses contradict each other? b. Are there a sufficient number of witnesses? c. Were the witnesses truthful? d. Were they non-prejudicial? (e.g., Consider Saul who was opposed but became Paul through evidence; Thomas who doubted but touched the evidence; scared apostles transformed into bold evangelists). Thus, according to the historiographical criteria of David Hume, the New Testament is reliable. God preserved the Originals in the copies! c. Clement of Rome (C. A.D. 95) used Scripture as a reliable and authentic source. d. Ignatius (A.D. 70-110), a disciple of Polycarp, he knew all the apostles and was a disciple, gave credence to the Scripture to the extent that he was martyred for it. e. Polycarp (A.D. 70-156) was a disciple of John who succumbed to martyrdom at 86 years of age for his devout devotion to Christ and Scripture. 1. OBJECTION: If inerrancy only applies to the autographa this provides a neat hedge from disproving the doctrine. If any time there is a difficulty one can assign the problem to the copy, claiming it does not exist in the original. ANSWER: This is a recognition that any copy will contain errors due to transmission. 2. OBJECTION: If we no longer possess the autographs, the qualification that it does not exist in the autographs is meaningless. ANSWER: Just because we have lost the autographic codex (the physical documents) does not mean we have lost the autographic text (the words of the original). The words of the codex are in the good copies. They were preserved and restored through the providence of God and the science of textual criticism. There is a great deal of difference between a text that is initially inerrant and one that is not. The inerrant autograph can be restored to the state very near the inerrant original through the science of textual criticism. But the restoration of an errant autographa to an inerrant original is hopeless. 1. Though the Scriptures as given are completely true, no human interpretation of them is infallible. In other words, if one does not have the correct meaning of the text, he will never be justified in claiming that it is false. 2. The key principle in the application of hermeneutics in this area is the analogy of faith as taught by the Reformers. "This principle merely says that we should attempt to harmonize apparently contradictory statements in the Bible. That is, if there is a way of understanding a passage so that it is in harmony with the rest of Scripture and another way of understanding that conflicts with all other Scripture or parts of Scripture, the former is God’s correct revelation -- not in the sense that later revelation ever falsifies, but that it often supplements, earlier revelation. Only in this way can it be affirmed that the Bible is true in the whole and in its parts." 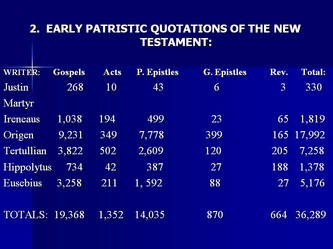 C. Inerrancy is related to Scripture’s intention. 1. Scripture accurately records many things that are false, for example, the falsehood of Satan and human beings. 2. Scripture's intention is found in the meanings of the biblical sentence (the historical, grammatical hermeneutic). D. Inerrancy does not demand strict adherence to the rules of grammar. In other words, a grammatical error in the Bible does not disprove inerrancy. Rules of grammar are merely statements of normal usage of the language. E. Inerrancy does not exclude the use either of figures of speech or of a given literary genre. 1. Figures of speech: meiosis, hyperbole, synedoche, personification, metonymy, etc. 2. Literary genre - narrative, dramatic, apocalyptic, poetic, didactic, etc. F. Inerrancy does not demand historical or semantic precision. All is the required is that the statement is adequate to reflect the truth. Almost any statement is capable of greater precision. The crucial point for inerrancy is: Is a sentence as stated true? G. Inerrancy does not demand the technical language of modern science. 1. It was not the intentions of the writers of Scripture to provide a scientific explanation for all things. 2. Popular or observational language is used even today by the common man. We say, for example, that the sun "rises" and "sets." This is not intended to be a scientific description of solar revolution. 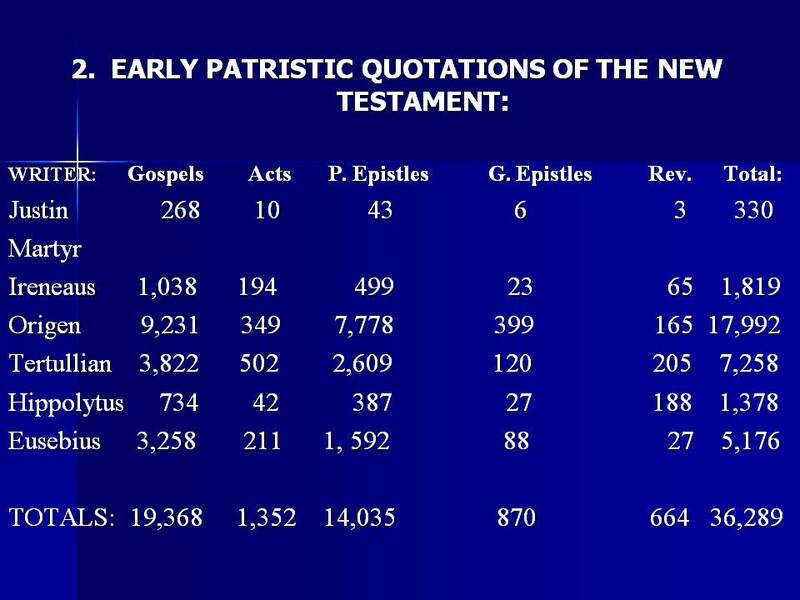 H. Inerrancy does not require verbal exactness in the citation of the Old Testament by the New Testament. I. Inerrancy does not guarantee the exhaustive comprehensiveness of any single account or of combined accounts where those are involved. For example, none of the gospels is obligated to give an exhaustive account of any event. He has the right to record an event in light of his purposes. Furthermore, it must be remembered that the accounts of all four Gospel writers do not exhaust the details of any event mentioned. All that is required is that the sentences used by the writer are true. B. Deuteronomy 13:1 - 5 and 18:20 - 22: One of the marks of a divine message is total and absolute truthfulness. 1. Jesus accepted the plenary inspiration of the Bible - "every word that proceeds out of the mouth of God." 2. Jesus accepted the truth of the proposition of the Bible. He did not focus on a person's subjective, existential experience (like the Neo-Orthodox do), but upon the written Word. 3. The historcity of Lot and his wife and the destruction of Sodom and Gomorrah. 5. He acknowledged the historicity of Isaiah, Elijah, Daniel, Abel, Zechariah, Abiathar, David, Moses and his writings, Abraham, Isaac, and Jacob. 1. Law and the Prophets will not be abolished but fulfilled. 2. The "Law and the Prophets" included the Old Testament Bible of our Lord. 3. We can count on the fulfillment of the Old Testament promises down to the "jots (smallest letter) and tittles (stroke)." G. Matthew 22:23 - 33 - Jesus bases the resurrection of the dead on the tense "I am" and not "I was" which is stated in Exodus 3:6. 2. He assumed that God's revelation came in a propositional statement. 3. He assumed that every word of that statement could be trusted to be precisely accurate. H. Matthew 22:41-46..."The LORD [that is, the Father] said to my LORD [the Messiah who was David's Lord]: Sit at My right hand [the Father's] until I [the Father] put Thine [the Messiah] enemies beneath they feet." Natural procreation links Messiah to David as David's descendant. The pronoun "my": in Psalm 110: links Messiah to David as David's Lord God. And the pronoun "my" is simply a yodh [ ' ], that smallest of Hebrew letters, attached to the word Lord." (Ryrie, 104 - 105). So if God superintended over the writing of each word, what does that mean about the veracity of the scriptures? If we believe God is a truthful God, his writings would also be truthful. This is the feeling of King David as he writes Psalm 19. David, in describing the Scriptures, uses adjectives such as perfect and sure (v. 7), right and pure (v. 8), clean and true (v. 9). Absolute Inerrancy. All matters, spiritual, historical, and scientific, are true. Full Inerrancy. The Bible is completely true, but is the bible’s primary aim is not to make scientific or historical assertions, but theological and spiritual facts. Limited Inerrancy. The Bible is only true in theological or spiritual matters, not scientific or historical matters. ...and the Scriptures are true. Therefore, it would seem that limited inerrancy has problems.